Captain J.J. helps display a nice 33 pound Black-fin Tuna caught by one of the lady anglers of the Lady K. The fish hit in deep cobalt blue water during a recent summer-like morning trip. Wonderful job by the angler and crew alike! 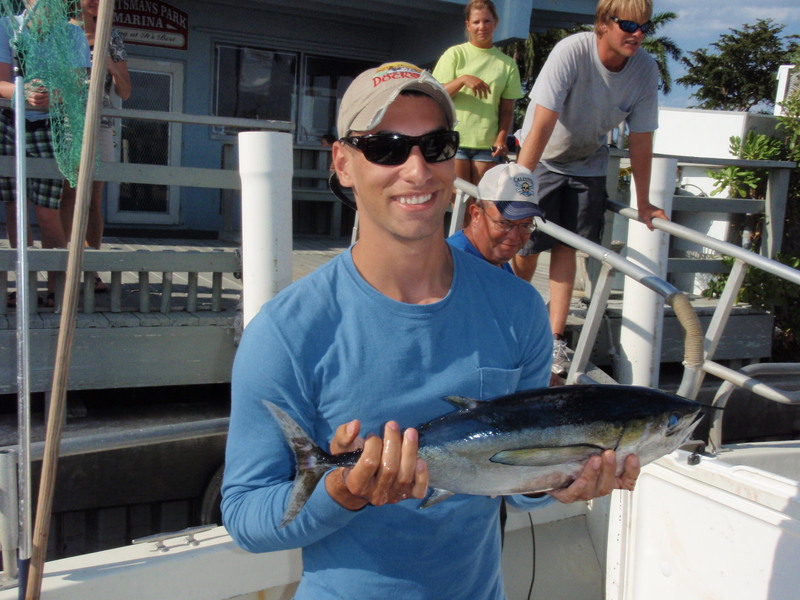 There have been a few Black-fin Tuna caught aboard the Lady K the last few days. 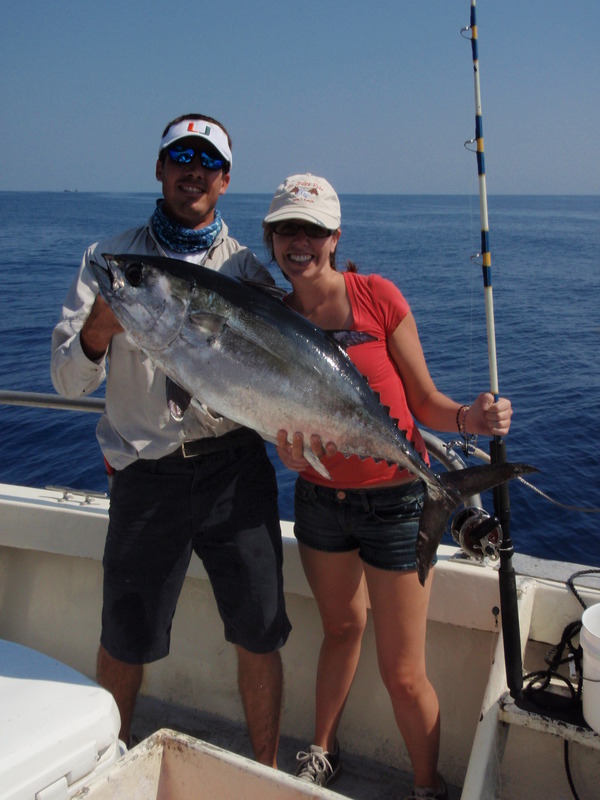 Most of the fish are “football” sized fish that are holding around the small schools of bonito passing through the area. Lighter line and fluorocarbon leaders can help give an angler an edge on these good eating fish. Tunas have very keen eye-sight and may typically be caught under any passing schools of bonito (False Albacore). Although the grouper season is closed until May 1st, anglers are still having fun fighting the fish up to the boat and posing for a quick photo before the fish is vented and safety released back to the reef. 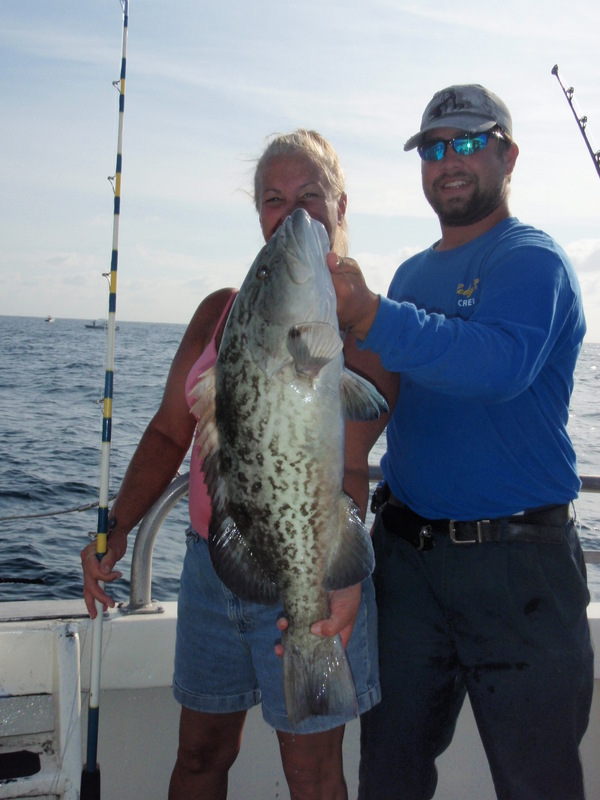 Grouper can be caught using either a drift rig baited with a sardine or by using a bottom rigged baited with cut squid. The best part of fishing is never knowing what is going to hit your line. 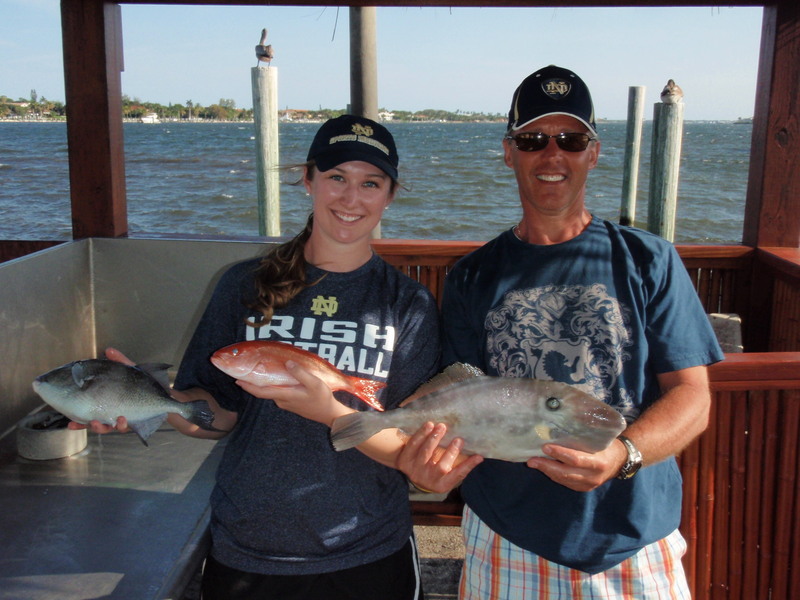 Anglers fishing bottom rigs have been keeping busy catching a variety of fish like the Gray Triggerfish (l), Vermilion Snapper (c) and Unicorn Filefish (r). Bottom fishing is a perfect way to introduce children or beginning anglers to the art of fishing. The wide variety of reef fish that can be caught while bottom fishing can be astonishing at times. Most of the fish caught by bottom rigs will weigh between one to five pounds but don’t be surprised when a 40 pound fish takes the bait! No matter the style of fishing you choose, drifting or bottom, the important thing to remember is sharing the quality time with your family and friends. Angling families are encouraged to bring cameras for photos and plenty of sunblock for the children – of all ages. Bring some snacks and soft drinks, kick back and relax under the resplendent Florida sun and lets have some fishing fun!